We've seen plenty of robots and we've seen a fair amount of fish, but have you seen a fish controlling a robot with a sword? 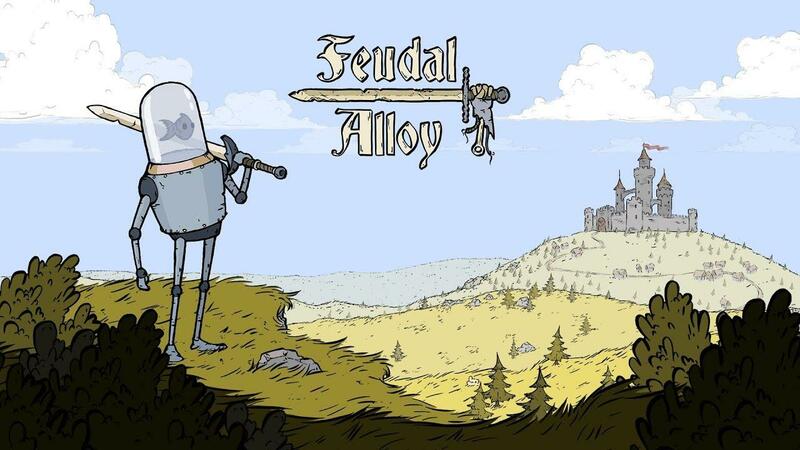 Say hello to Feudal Alloy. 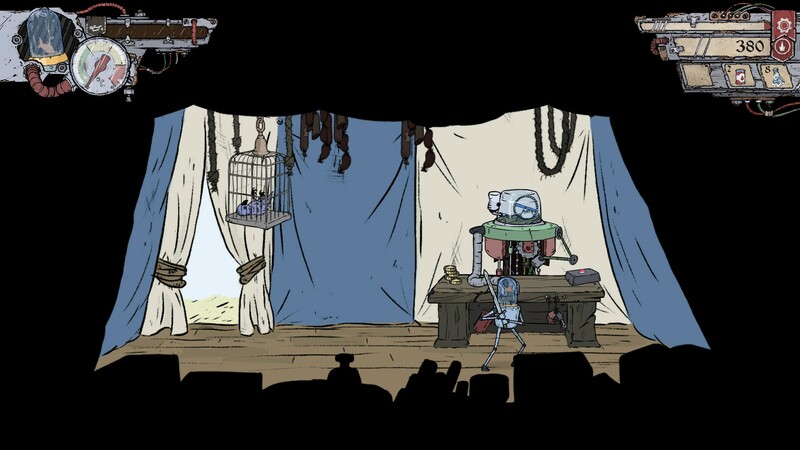 In Feudal Alloy you play as Attu, a kind-hearted soul who looks after old robots. His village was attacked, oil supplies were pillaged and so he sets off to reclaim the stolen goods. As far as the story goes, it's not exactly exciting or even remotely original. Frankly, I thought the intro story video was a bit boring and just a tad too long, nice art though. Like a lot of exploration action-RPGs, it can be a little on the unforgiving side at times. I've had a few encounters that I simply wasn't ready for. The first of which happened at only 30 minutes in, as I strolled into a room that started spewing out robot after robot to attack me. One too many spinning blades to the face later, I was reset back a couple of rooms—that's going to need a bit more oil. What makes it all that more difficult, is you have to manage your heat which acts like your stamina. Overheat during combat and you might find another spinning blade to the face or worse. Thankfully, you can stock up on plenty of cooling liquid to use to cool yourself down and freeze your heat gauge momentarily which is pretty cool. 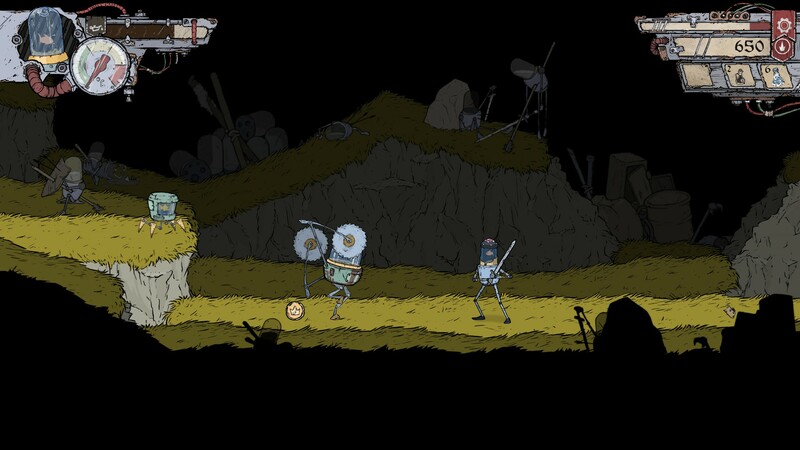 One of the major negatives in Feudal Alloy is the sound work. The music is incredibly repetitive, as is the hissing noises you make when you're moving around. Honestly, as much as I genuinely wanted to share my love about the game it became pretty irritating which is a shame. It's a good job I enjoyed the exploration, which does make up for it. Exploration is a heavy part of the game, as of course you start off with nothing and only the very basic abilities and it's up to you to explore and find what you need. Some incredible talent went into the design work, while there's a few places that could have been better like the backdrops the overall design was fantastic. Even when games have issues, if you enjoy what you're seeing it certainly helps you overlook them. Bonus points for doing something truly different with the protagonist here. We've seen all sorts of people before but this really was unique. The Linux version does work beautifully, Steam Controller was perfection and I had zero issues with it. Most importantly though, is it worth your hard earned money and your valuable time? I would say so, if you enjoy action-RPGs with a sprinkle of metroidvania. Available to check out on Humble Store, GOG and Steam. I have a lot of hope, since I love metroidvania games and the art style is great. Nice to see fellow countrymen are supporting Linux .